Eyesight problems are common amongst all ages and if left untreated can cause dreadful headaches and problems with reading. The good news is that most eyesight issues can easily be sorted out by wearing glasses, but discovering they need specs doesn’t always go down well with everyone. Having regular eye tests is important for everyone, not just existing wearers of glasses or contact lenses. Children and teenagers under the age of 16 (and up to the age of 19, for those in full-time education) are entitled to have free eye tests on the NHS, plus a voucher towards the cost of a prescription if glasses are required. As the eye test is free, there’s no excuse for not taking up the opportunity to have a regular eye test – preferably about once a year. Wearing glasses isn’t always regarded as all that cool and may be something teens who suddenly need to wear glasses may resist (if they’ve grown up wearing them, then they may be more used to it). However, if eyes are found to be in poor health, not wearing glasses can put even more strain on their eyes and could cause even more deterioration. A lot of well known people – pop stars, movie stars and celebrities – wear glasses, so pointing them in the direction of well known glasses wearers may help ease the pain. Thankfully the days of little choice of glasses frames for teenagers are gone and there’s now a wide selection of frames available, from practical to funky, with rims and without. If your teen does need to wear glasses, then it’s good to let them be involved in choosing the type of frames they want (within your price range), as they’ll be able to choose something they feel comfortable wearing. Don’t forget to be guided by the optician too, as depending on the type or thickness of lenses they require, some frames may be more suitable than others. For teens involved in sporting activities, investing in spare pairs is recommended, in case of accidents. It’s also worth noting that plastic lenses are perhaps more practical than glass and good quality frames with flexible springs may wear better than easily breakable ones. To help avoid unnecessary damage to glasses, your teen should be made aware of how to care for their glasses. For example, by using a glasses case to keep them in when they’re not being worn (lots of funky designs are available, or you could customise your own case) and to keep them regularly cleaned so they can see out well. 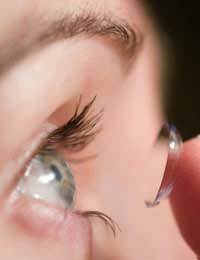 Contact lenses are a common alternative to glasses and are worn very close to the eye. In general, opticians, or optometrists, don’t usually advice that children wear contact lenses, as they can be fiddly to put in and take out and involve a lot of care to ensure the lenses are kept clean. However, once they’re in their teens, and especially when aged 16 or older, contact lenses do become a viable option. If your teen is interesting in exploring the option of contact lenses, then in the first instance it would be best discussed with an optician. Some people get on really well with contact lenses and never look back to glasses, but other people find them a bit more tricky to get used to. So it may involve a trial run first, to see how your teen adapts to them. Whatever eye wear your teen needs, don’t forget to take good care of the glasses and lenses and book regular checks once a year. In many cases, wearing glasses can help improve changes to the eyes, so it’s well worth it!